Talk about a week investors would rather forget: New-home and existing-home sales plummeted, U.S. GDP growth slowed in the second quarter, and consumer sentiment unexpectedly declined, dipping to 68.9 in August from the preliminary reading of 69.6, Reuters reported Friday. A Bloomberg survey had expected the final August Thomson Reuters/University of Michigan consumer sentiment index reading to remain flat at 69.6. 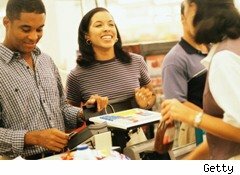 Consumer sentiment was at 67.8 in July, 76 in June, and 73.6 in May. Excluding the June rise, consumer sentiment has trended lower in 2010. Richard Curtin, Thomson Reuters/University of Michigan director of surveys, said the sentiment reading shows that consumers are trying to hang in there amid a flurry of difficult and sobering data on the U.S. economy. "The good news is that consumers have shown some resilience in the face of slowing economic growth and the media's double-dip drumbeat," Curtin said in a statement, according to Reuters. "The bad news is that consumers expect lackluster income and job growth for an extended period of time." In the final August survey, the consumer-expectations component fell to 62.9 from the preliminary August reading of 64.1. The expectations component reading was at 62.3 in July, 69.8 in June, and 68.8 in May. Also, the current conditions component was unchanged from the preliminary August reading of 78.3. The current conditions component was at 76.5 in July, 85.6 in June, and 81 in May. Meanwhile, the one-year inflation outlook dipped to 2.7% from the preliminary August reading of 2.8%. Economists, business executives, and policy makers monitor consumer sentiment because, historically, consumer attitudes have been correlated with their spending decisions. In general, rising consumer sentiment leads to levels of spending that are the same or higher. Falling consumer sentiment usually leads to the reverse. Consumer spending has accounted for 65% to 70% of U.S. GDP. The dip in the August consumer-sentiment reading is consistent with the revised, low 1.6% second-quarter GDP growth rate and other recent economic statistics that are flashing warning signs regarding the economy. Consumers sense that commercial activity is slowing, with the declines in home sales and the weak job market providing perhaps the most visible signs of the slowdown. Moreover, given the nation's high unemployment rate staying stubbornly high over the past year, it's noteworthy that consumer sentiment hasn't fallen more. Still, investors shouldn't read too much into that sideways action: Consumers are still saying they're very concerned about the economy's ability to create jobs and improve their personal financial situation. Further, more vigorous GDP growth with adequate job creation will be needed for consumer sentiment to make a sustained climb.